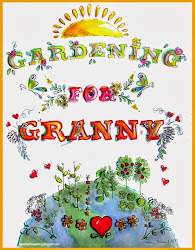 Spring Garden Acre is a blog about our family's gardening adventures. We call our place Spring Garden Acre, because we live on Spring Road with about an acre. We're located in zone 6b of south central PA. We grow peaches, berries, vegetables and keep a few chickens for eggs and meat. It's that time again. 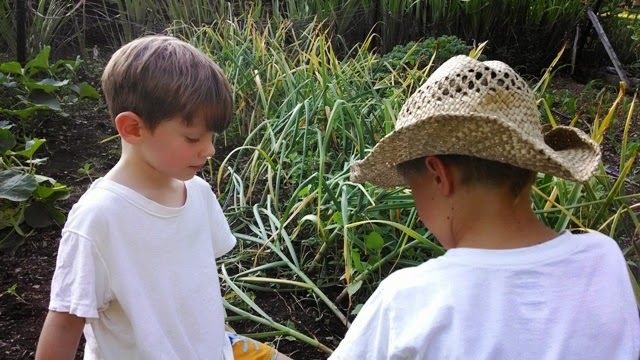 On Wednesday we harvested our garlic patch. We keep 5 varieties Aglio Rosso (purple stripe family), Khabar, Siberian, (creole family), St. Helens and Silver White (silverskin family). This is our third harvest of these lines. The creole family and silverskins are doing the best. Aglio Rosso is hanging in there, getting better each year, but it struggles in this zone. They all get better with each new year. 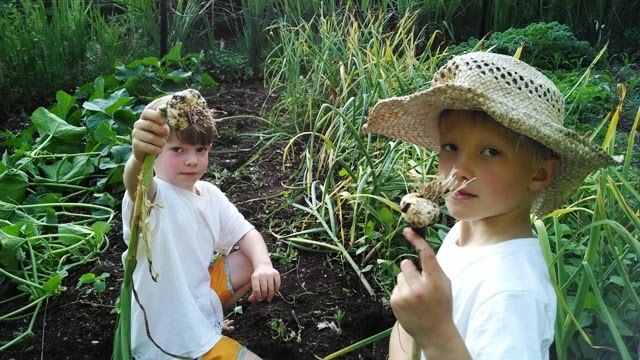 The kids seem to enjoy this time in the harvest year. 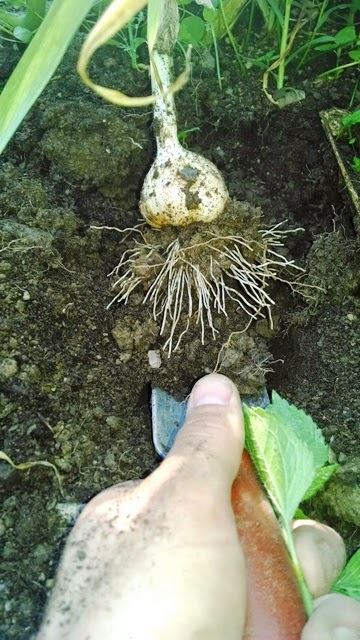 First comes the asparagus in spring, then the Asian vegetables, after that the June strawberries appear, then the brassicas and now root vegetables and garlic! Next comes the summer stuff. That's when things really get busy! For now, I'm thankful the garlic is hanging in the basement to dry! WOW! that's A LOT of garlic! I've never tried any of these varieties, how do they taste? Very hot and spicy or mild? Mild! We are even able to add a clove to our juice drink each morning. We've never had trouble with spiciness. Thanks for stopping by! This harvest will last until this time again next year! Nice garlic. I still have a couple of cloves left over from last year, but that is it. I think they will be introduced to the compost pile. I probably should cut them up first. 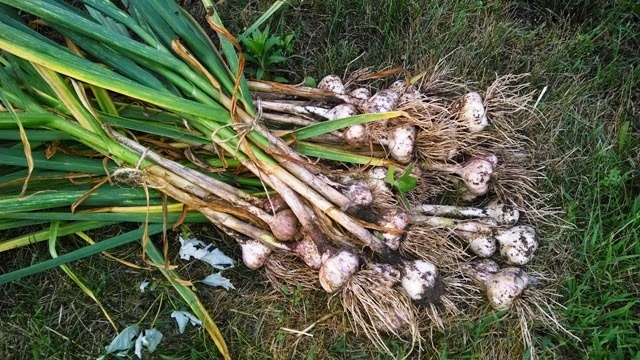 It is amazing how long some varieties of garlic will last. Your garlic looks great! I harvested mine last weekend. It grew very well in spite of no mulching. I can't believe how big the boys are getting! Thanks for sharing such an informative information. "Live quietly... work with your hands... be dependent on no one." 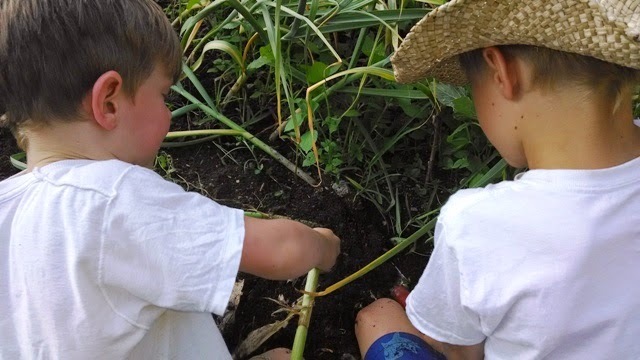 We're a small family that likes to garden in our spare time for fresh food and good times. Spring Garden Acre. Watermark theme. Powered by Blogger.